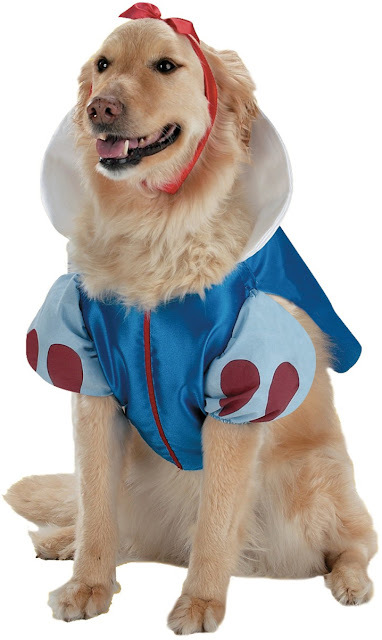 Just in time for Halloween, it's a Snow White puppy costume for the "trick-or-treating" pet lover. 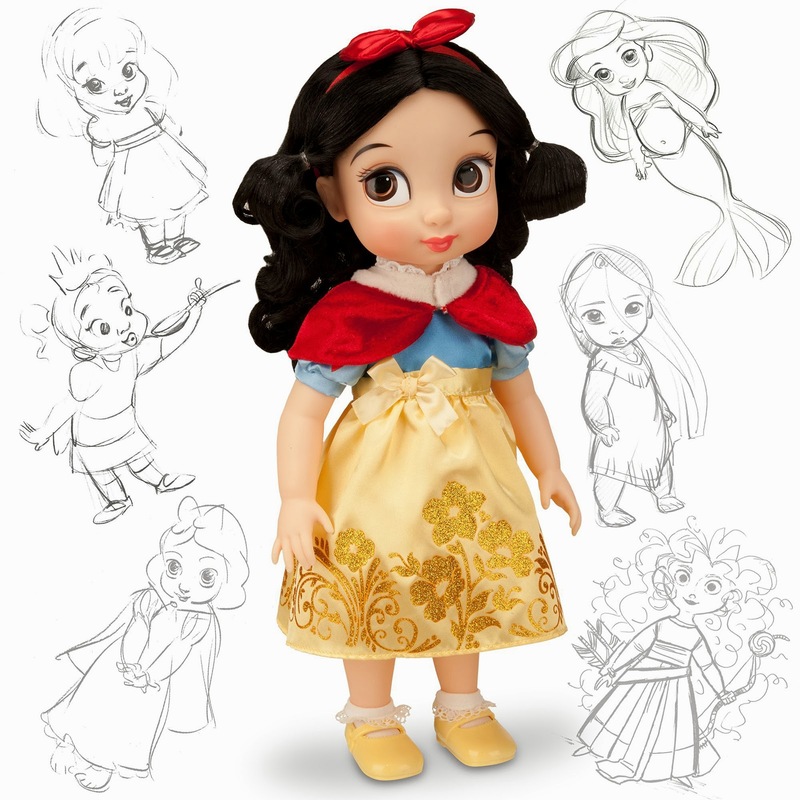 Includes doggie dress and red bow hair clip. Available in pet sizes XS, S and M. Disney licensed. 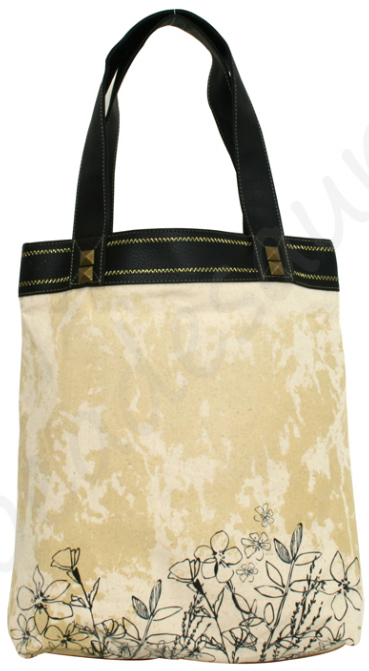 Original retail price $26.00 (USD). 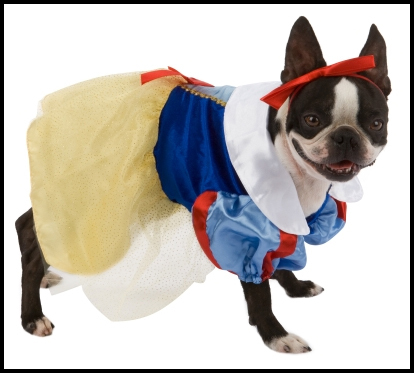 Collared Snow White bodice for the larger discerning dog. 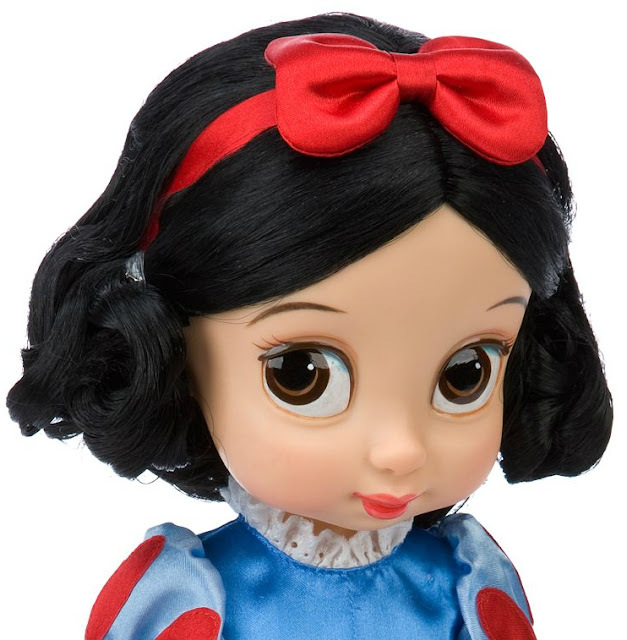 Includes bodice, sleeves, cape and headband. 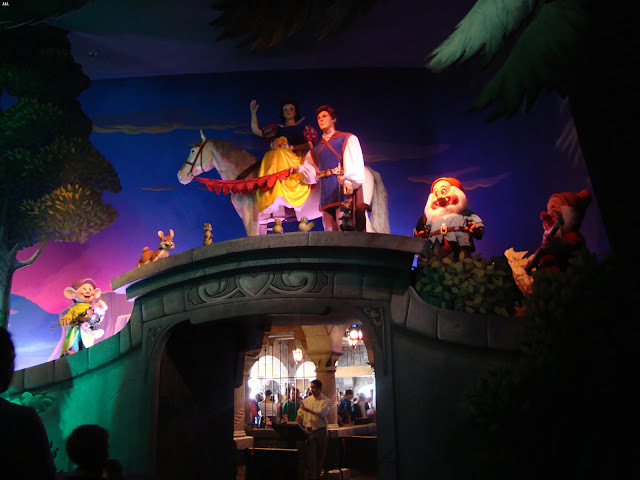 Disney licensed. 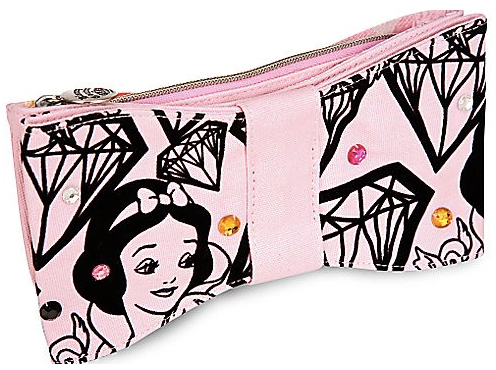 Originally $11.99. 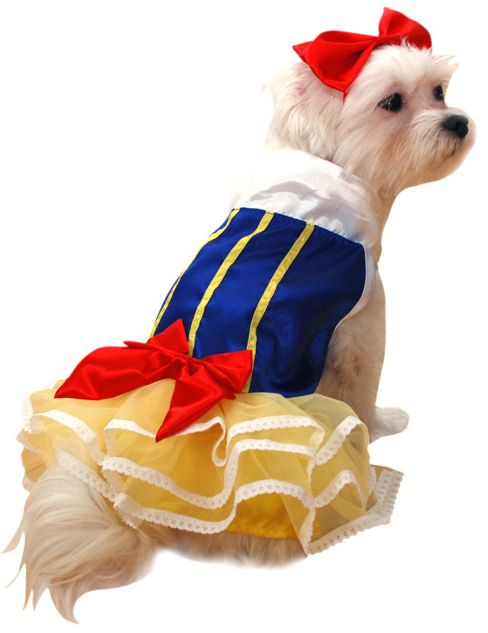 This doggie dress features a royal blue and white striped bodice, a ruffled yellow skirt, and two red bows. 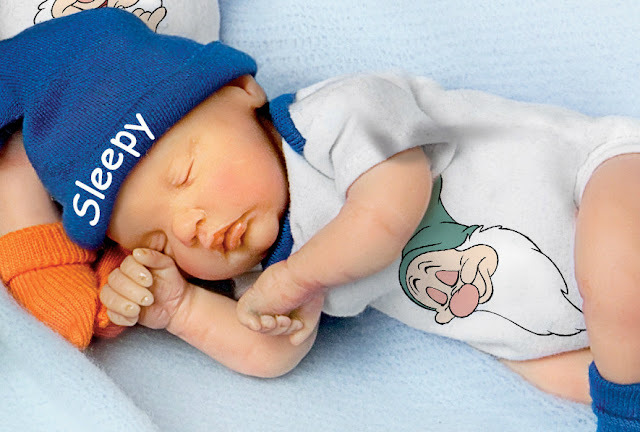 Disney licensed. 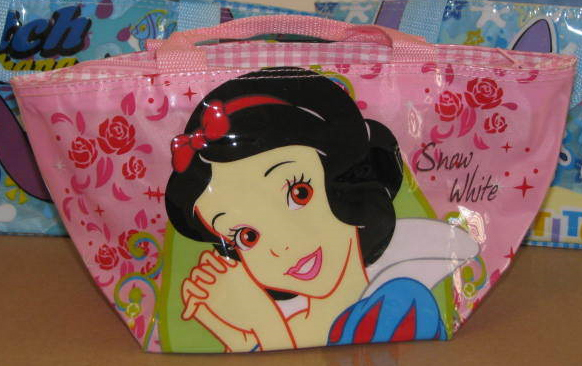 Originally $16.99. 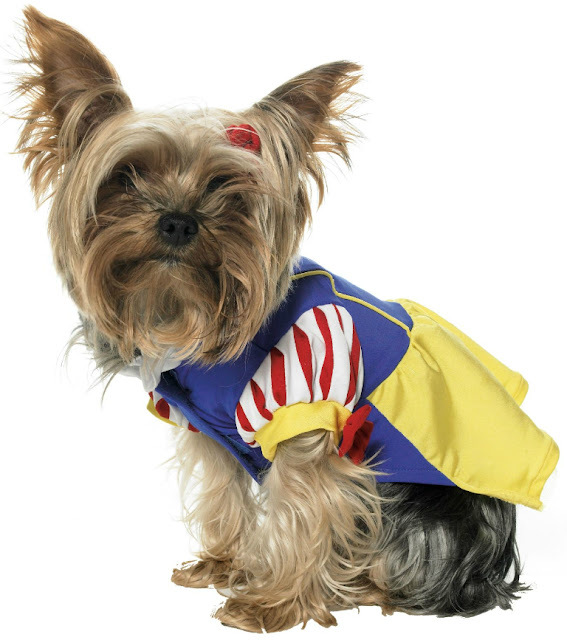 And finally, the dress that can turn any frumpy old pup into a princess. Sleeved bodice, frilly dress and red ribbons. 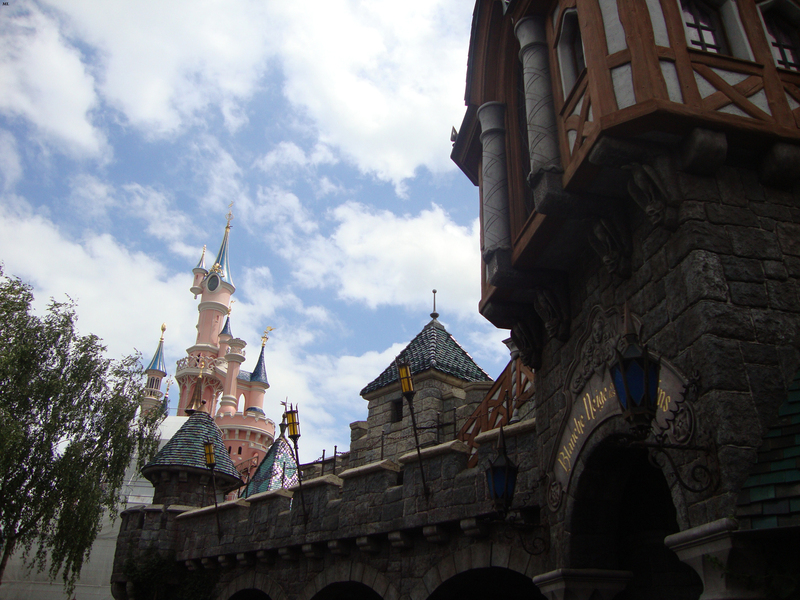 Disney licensed. 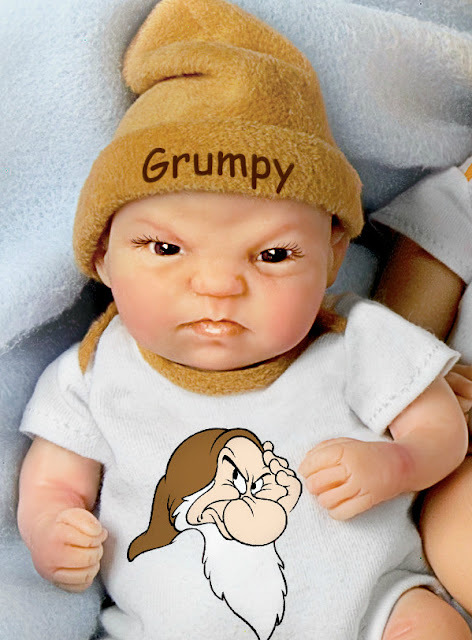 Original retail price $19.99. 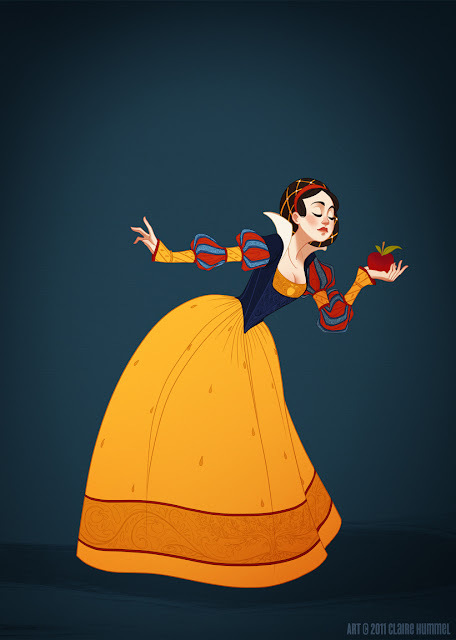 Artist Claire Hummel, aka shoomlah, has created a series of impressive illustrations featuring the Disney princesses in historical dress. Her Snow White design, for instance, is set in 16th century Germany. She says on her deviantArt page, "I took a wide swath from about 1500-1530 to come up with something that still maintained the spirit of the original design...Honestly? I just wanted to draw those damn slashed sleeves. I want them SO BAD." 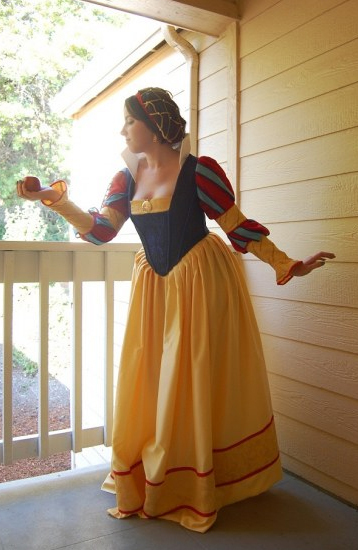 Claire says she receives requests from cosplayers asking permission to re-create her dress designs, though no one has ever sent her a photo of a finished dress...until now. 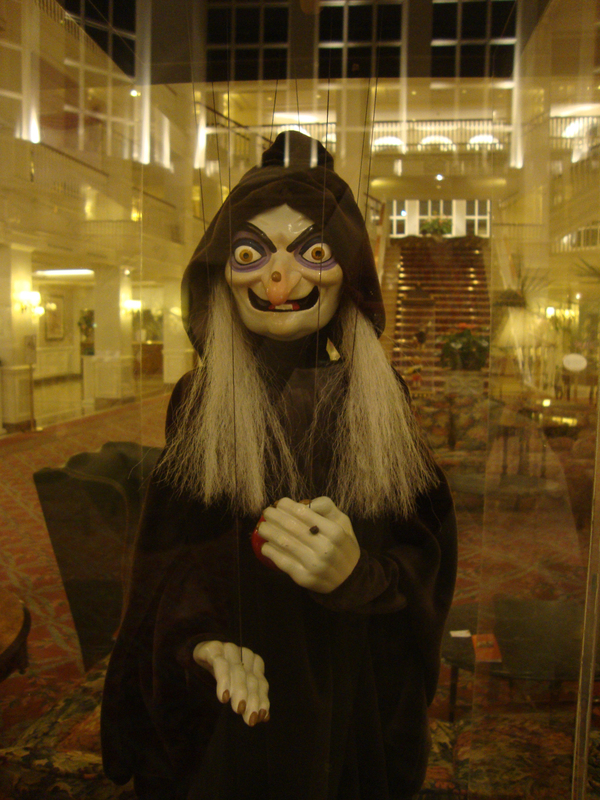 Here's a glowing example from costumer Chibirinoa who made the outfit for Halloween this year. Snood: The snood was one of the most annoying parts of this costume. It's made of a bunch of trim with hand sewn pearls between the diamonds and sewn down to bias tape with elastic strung through it. I'm wearing two wigs just to get the net full enough! Bodice: The main part of the bodice is suede and has center panel embroidery that I did free motion on my machine. 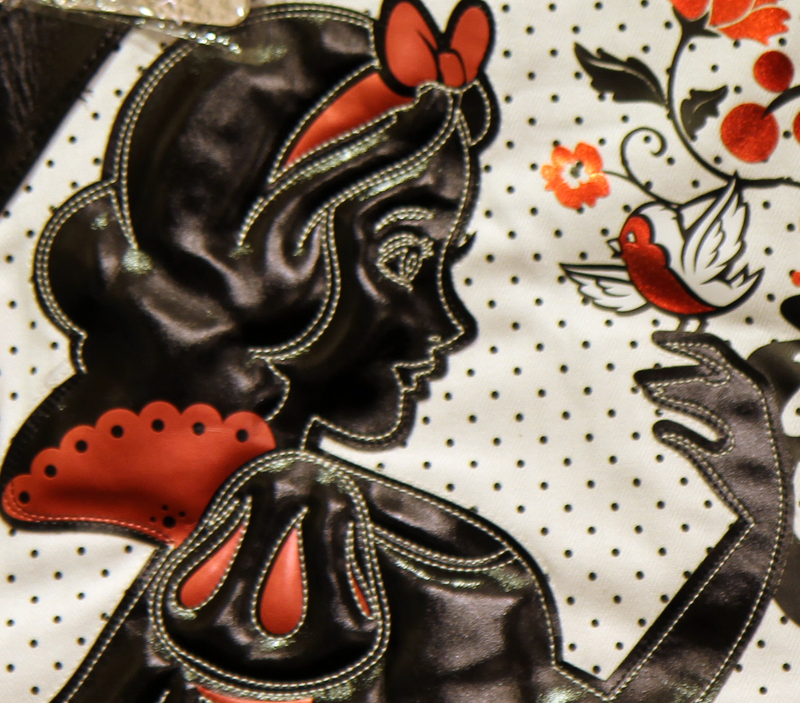 The gold on the sleeves was also embroidered with zig zag stitching to mimic the artwork. The rest of the fabrics are a loose weave boucle and a cotton eyelet. The back laces up with gold laces. 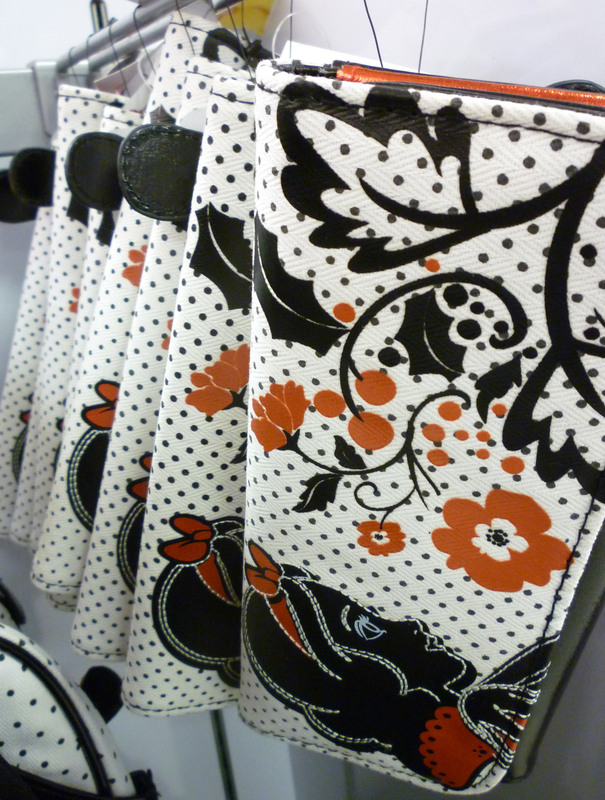 Skirt: the skirt is casa collection satin with the jacquard band and bias tape. The skirt had to have shoulder straps to keep it sitting high enough on my waist! 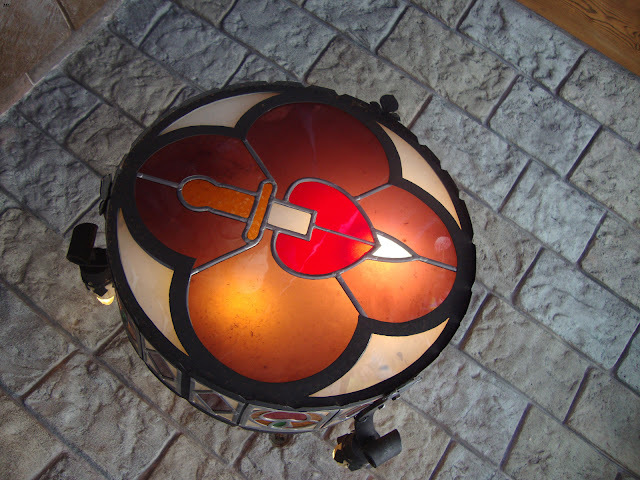 Muchas gracias to Hana Street for the notice on this. Snow White by Timothy Palin, digital media. All images copyright Disney Editions. Snow White by Alpesh Patel, digital media. 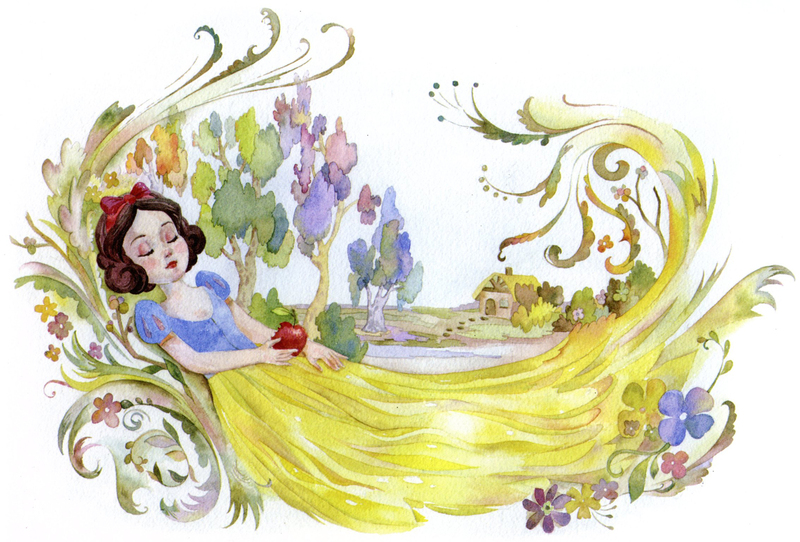 Snow White by Rebbecca Wong, watercolor, gouache and ink on watercolor paper. 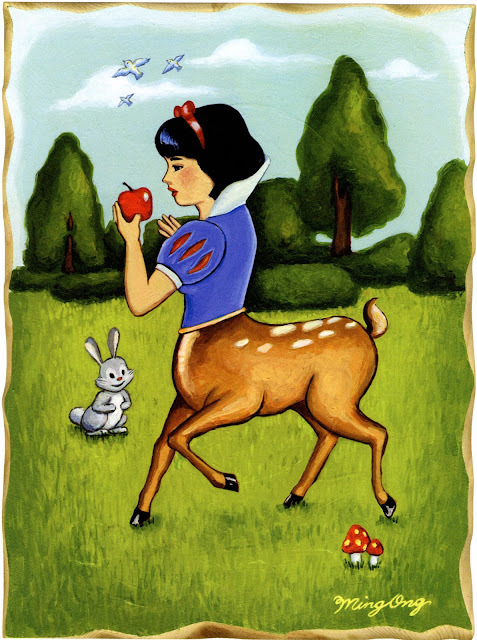 Snow White by Ming Ong, acrylic on wood. 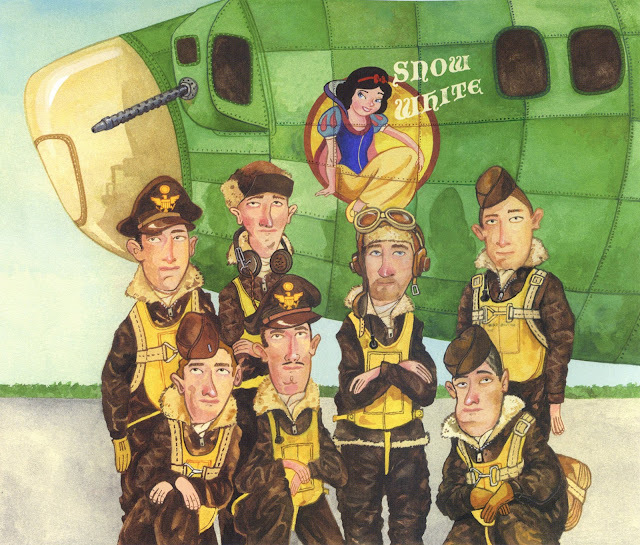 Snow White by Jeff Shelly; watercolor, gouache and digital media. 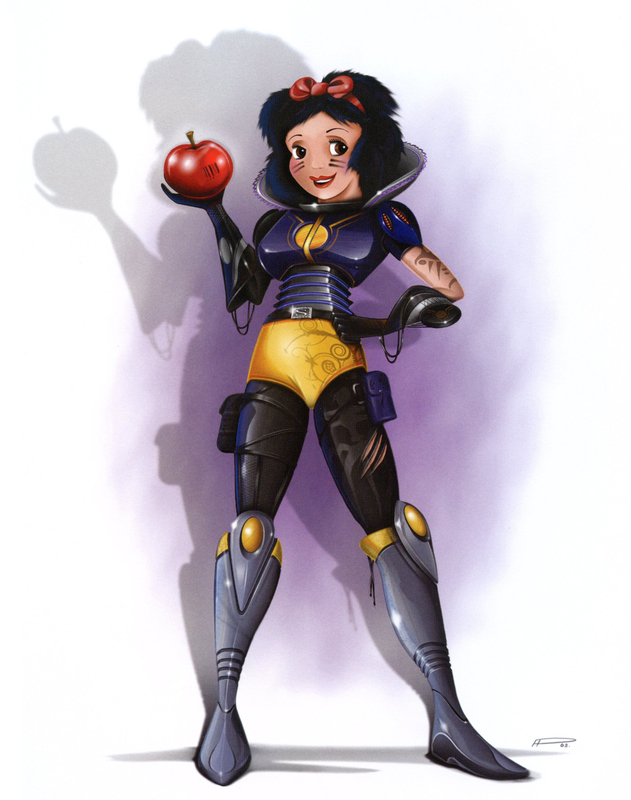 Haunted Mansion Snow White by Robert Farrell, digital media. 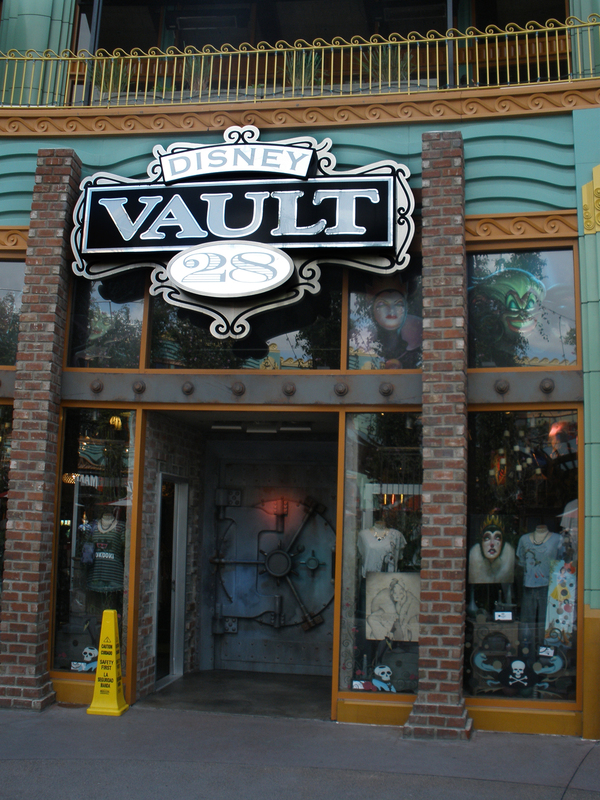 Robert Farrell's artwork was also seen for sale at the Disney Vault in 2011 at Disneyland Resort. Additional images courtesy of TokyoMagic of Meet the World. 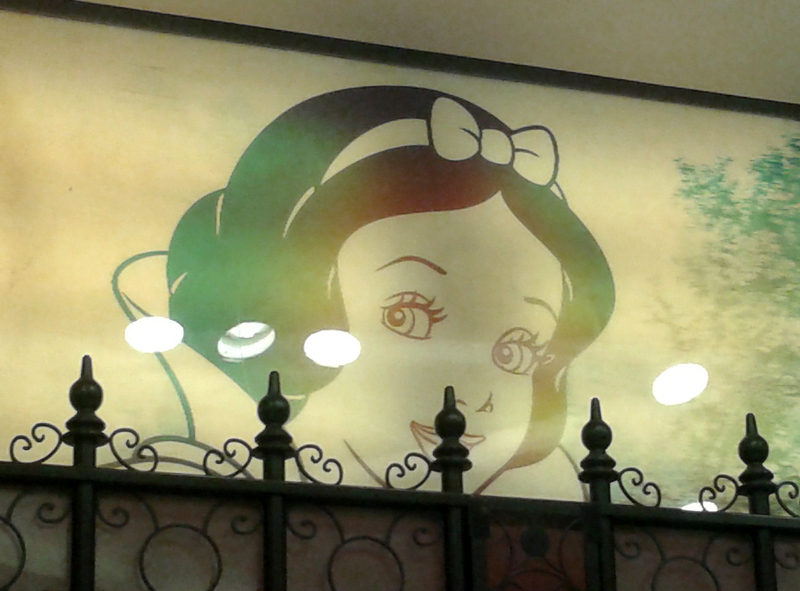 In the previous post, we saw Snow White as an infant. Now she's a toddler. 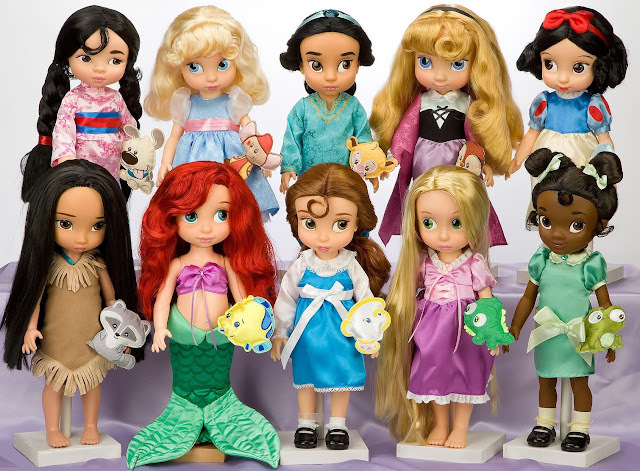 Created under the guidance of Walt Disney Studio's master animators Glen Keane and Mark Henn, the new Disney Animators' Collection is the re-imagining of 10 different Disney heroines as toddler dolls. 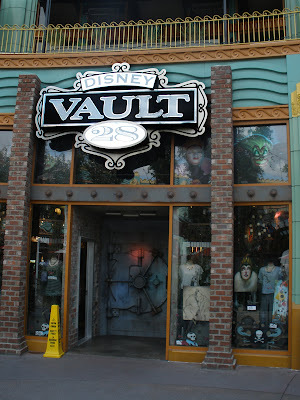 Released earlier this month on Oct 3rd at the Disney Store and the theme parks. Each doll stands 16'' tall. 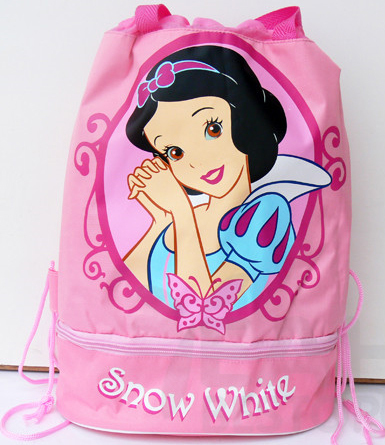 Retail price: $24.95 (USD). 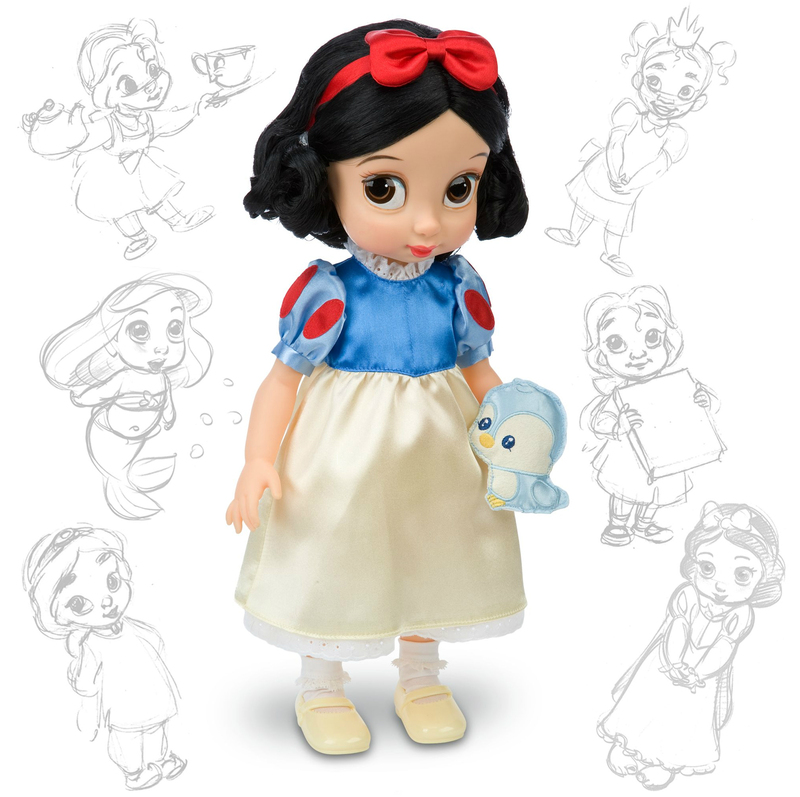 Available from the disneystore.com, this doll sold out online Oct 25th, was restocked Oct 26, and sold out again today Oct 27th. 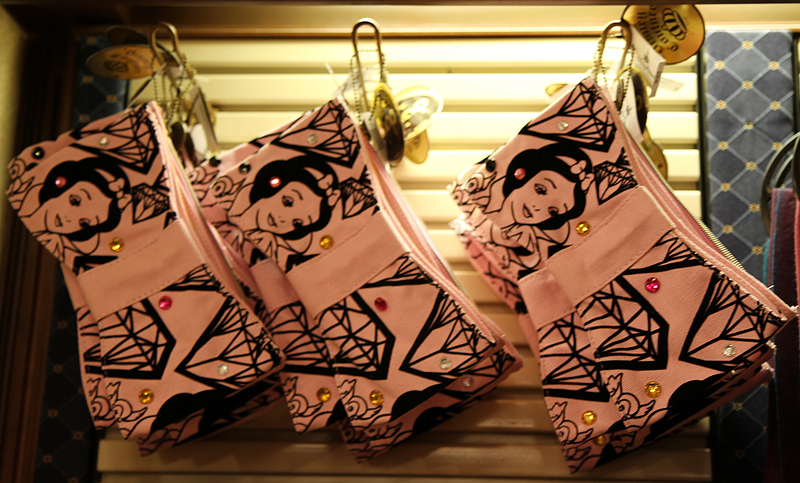 It will be restocked again. The dolls have been re-released at the Disney Store with new dress designs for 2013. 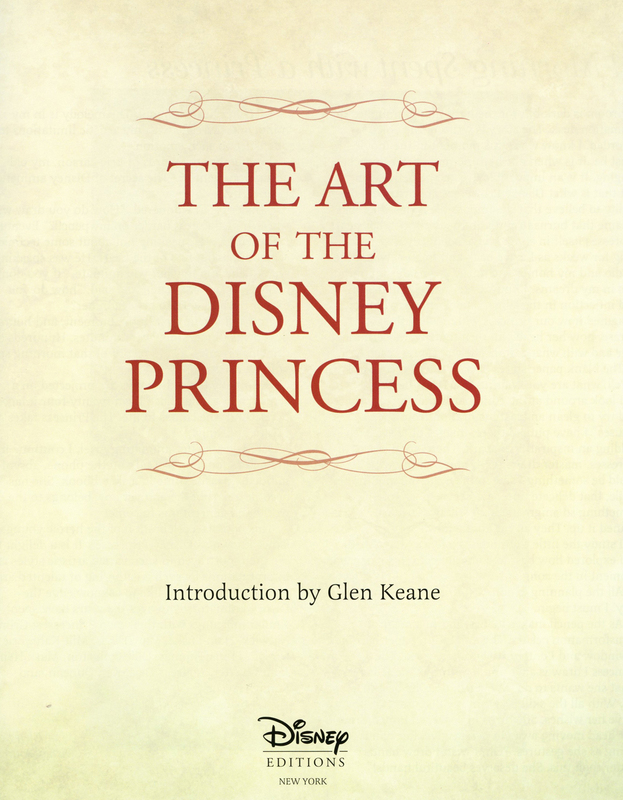 Retail price still at $24.95. Prepare yourself. 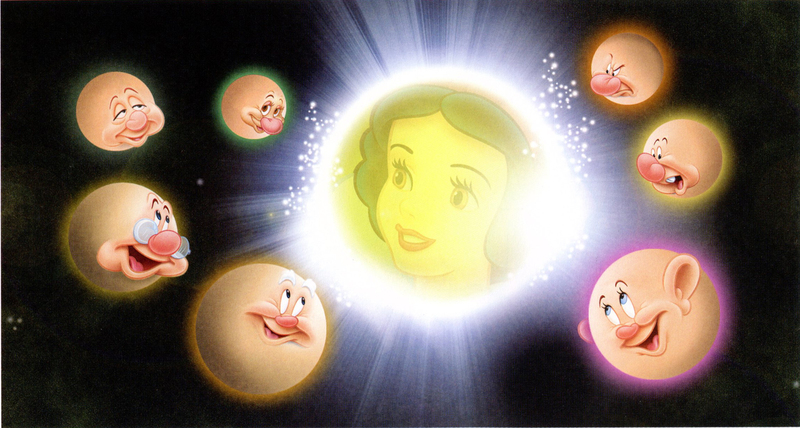 With the coming 75th anniversary in 2012 of Walt Disney's Snow White and the Seven Dwarfs, it's a certainty that we'll be seeing loads of commemorative items. 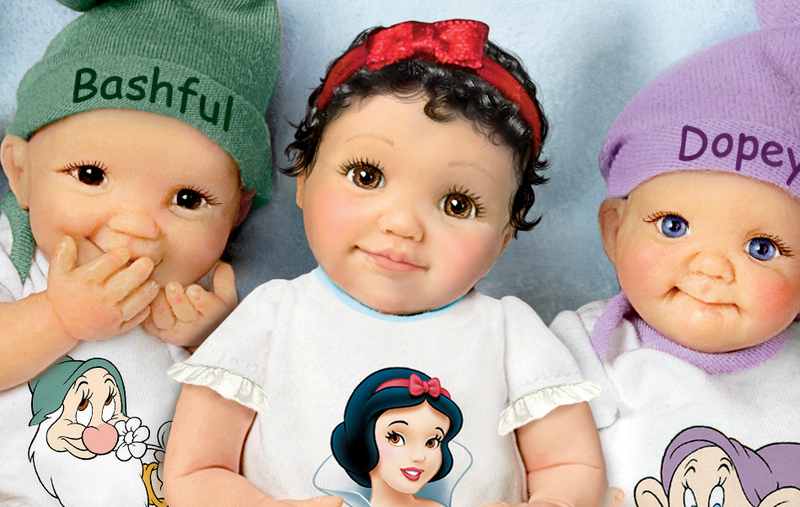 Here's a look at the first dolls to be created for this milestone. The Ashton-Drake Galleries has produced the It's Off To Sleep We Go collection. Honoring the 75th anniversary, this set features Snow White and the Dwarfs as...uh...baby dolls. A bit odd, but I have to admit, the facial expressions on some of these are quite good. Created by artist Cheryl Hill, the miniature figures are handcrafted in resin, and each measures about 6" tall (15.2 cm). Through a subscription plan, each doll is sold separately starting with the first issue, Happy. A new figure is then shipped to you about every month or two. 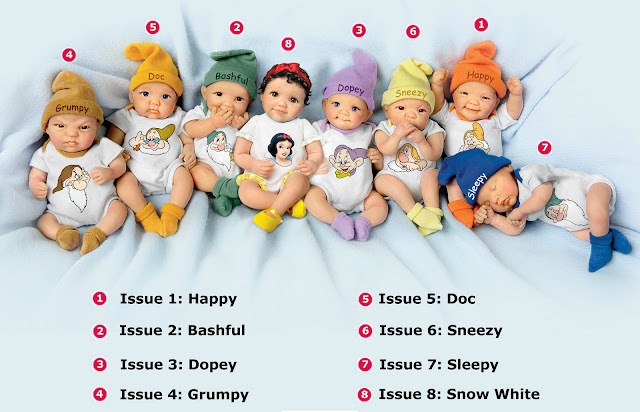 Price per doll is $39.99 (USD) + $7.99 shipping. 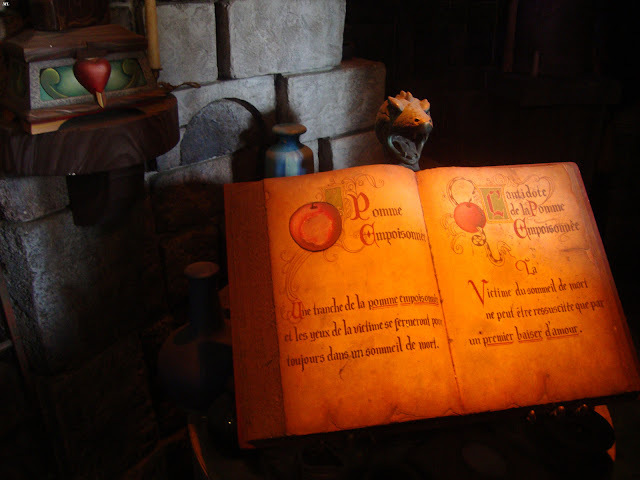 A Certificate of Authenticity accompanies each one. 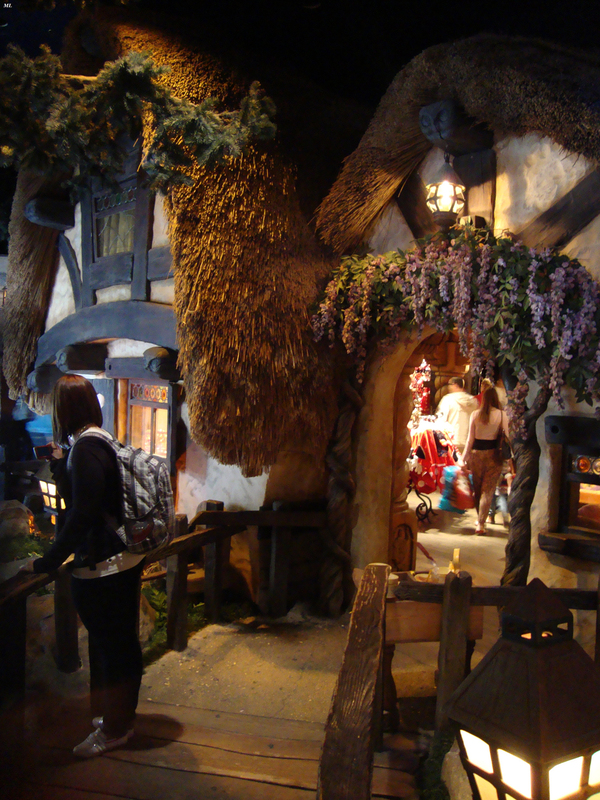 And a visit to the La Chaumière des Sept Nains, The Thatched Cottage of the Seven Dwarfs--a gift shop located in Fantasyland next door to the Scary Adventures attraction. 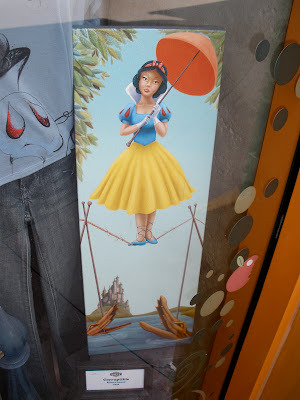 Special thanks to Disney Showcase Key for sharing his Snow White photos from Disneyland Paris. 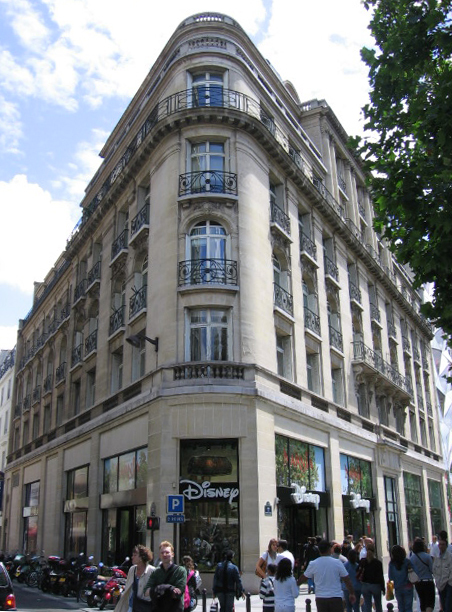 Before arriving at the parks, DSK stopped into the Disney Store on the Avenue des Champs-Élysées. 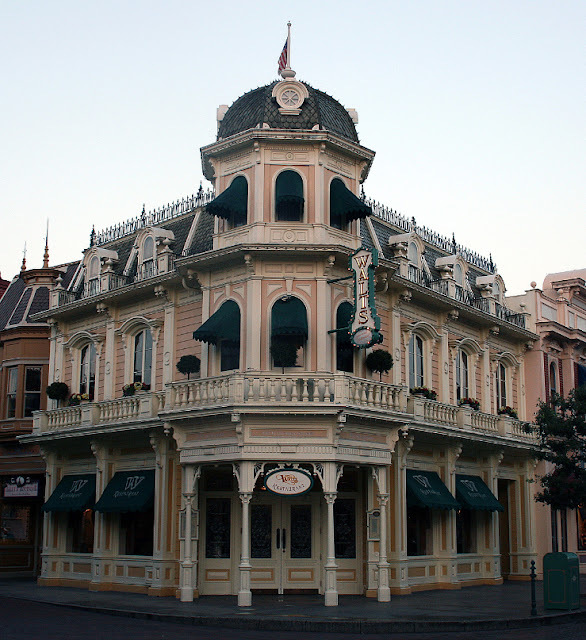 Disney Store outside facade via Waymarking.com. All other images courtesy of Disney Showcase Key unless noted. 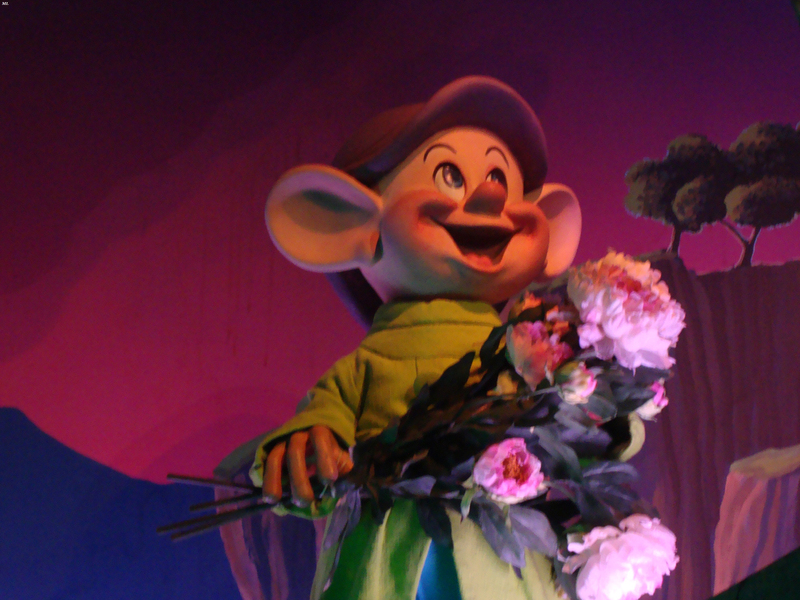 In a chamber off the central hub of the store, we find a mural of Dopey as he sneaks up the cottage stairs. 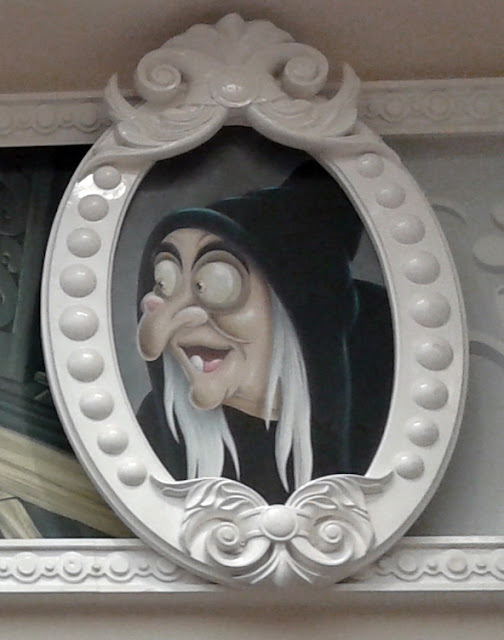 It's bordered on either side by a portrait of the princess and the Old Witch. 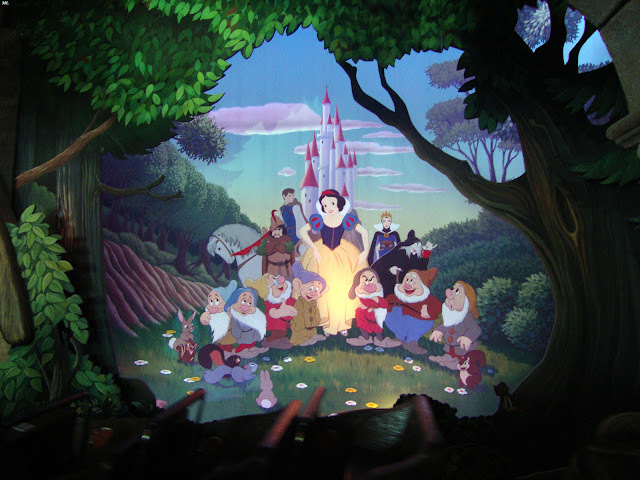 Tucked away in another room, a Snow White portrait shares space with Lilo and Cinderella. 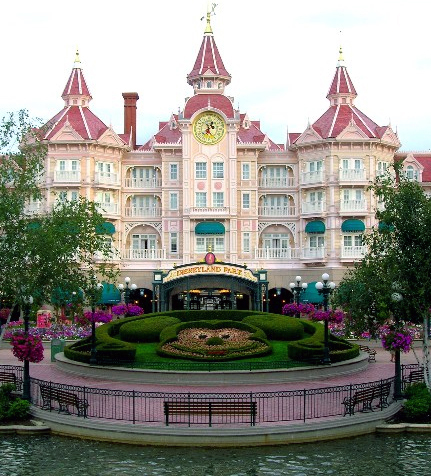 DSK stayed at the Disneyland Hotel which is located over the entrance to Disneyland Park. 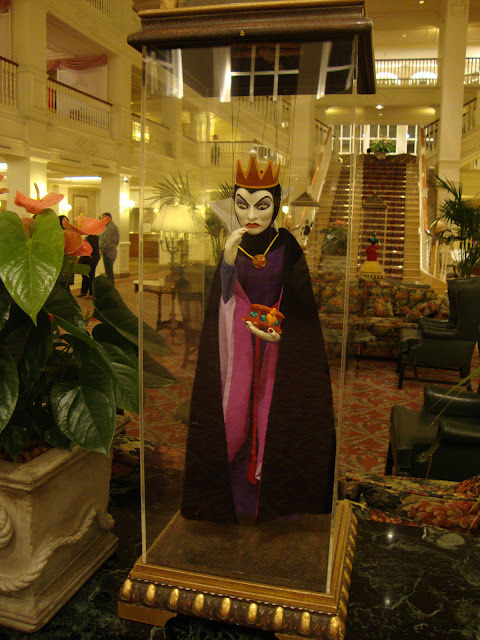 The Bob Baker Queen and Witch marionettes (from earlier post) are on display in the hotel lobby. Inside Disneyland Park, DSK stopped into Walt's Restaurant on Main Street. 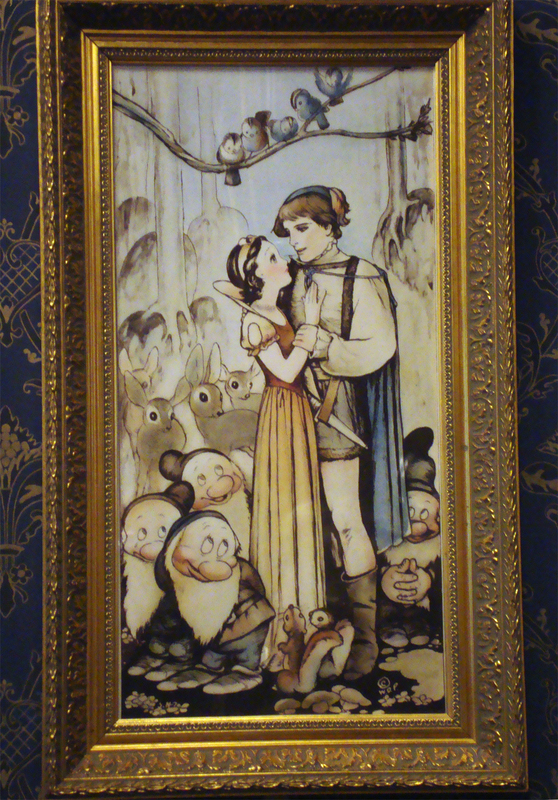 Among the other terrific theming found within the restaurant is this framed Tenggren lithography. 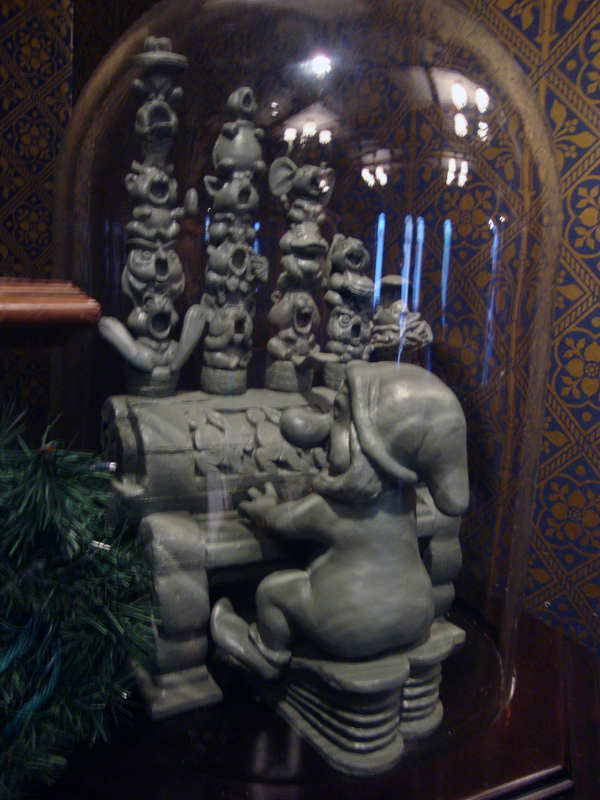 And a sculpture under glass of Grumpy (Grincheux) at his organ. 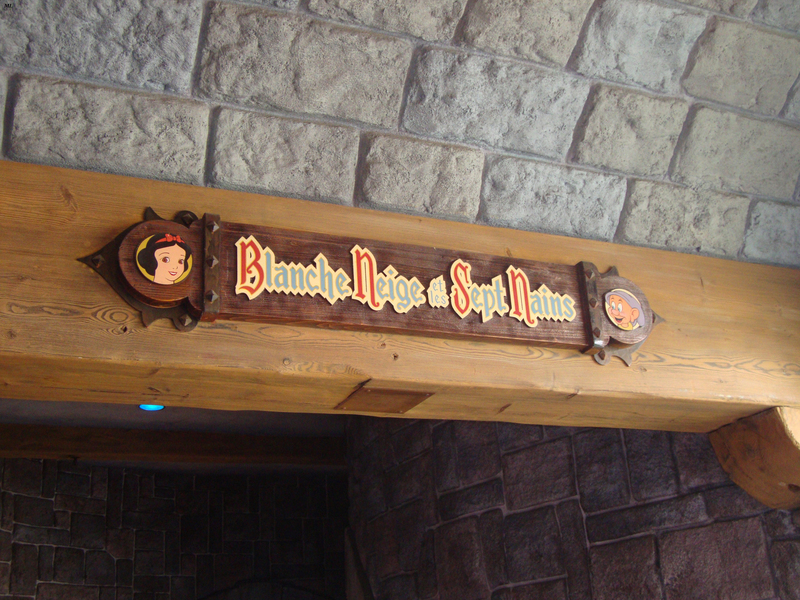 See more photos by Disney Showcase Key from his visit to Snow White's Scary Adventures. 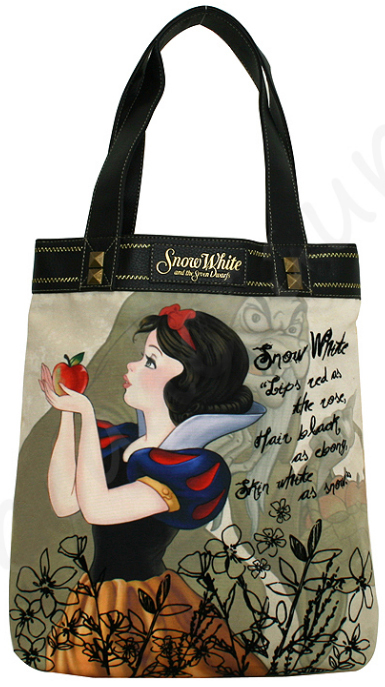 Snow White satchels and handbags continue to reign in their popularity. Quite a few pieces have been produced over the last few years (see earlier post on purses) and new ones continue to pop up in stores. Most are licensed by Disney but not all. We'll start off with this Loungefly leather-like purse (16" x 14"). 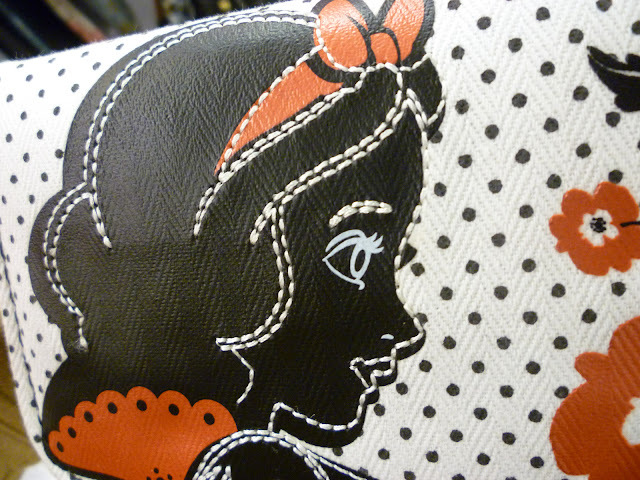 With Snow White applique, it's nearly identical to one seen a couple years ago except that the perforated white vinyl shell is more distinctive here. 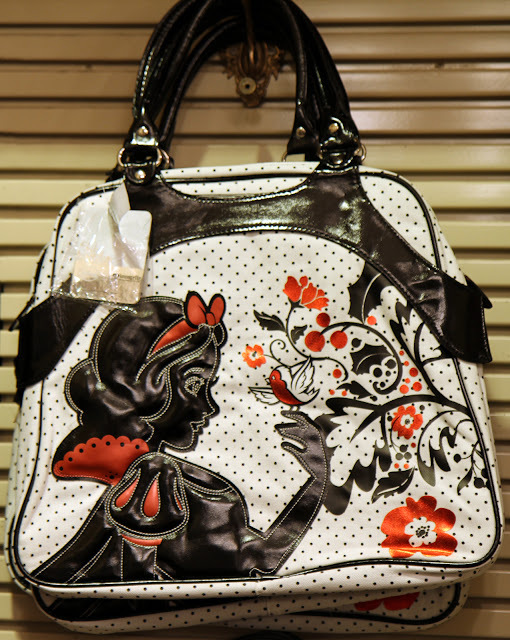 Loungefly Vinyl Handbag (2011). Images snapped at TrenD store, Downtown Disney, Orlando. 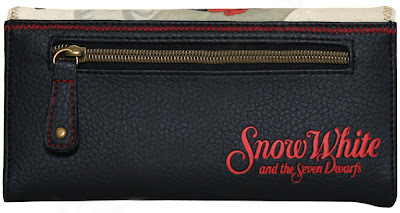 Loungefly does it again with a wallet to accompany the purse above. 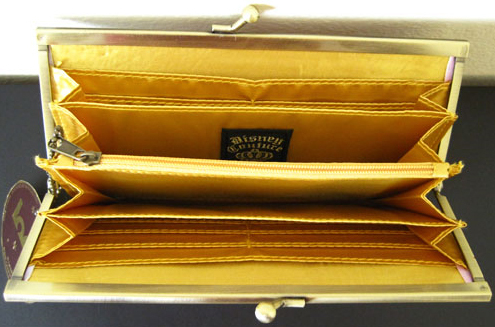 Loungefly Vinyl Wallet (2011). Images snapped at Disney Store outlet. Images courtesy of BBtoysHK and yeahbest88. Used with permission. Manufactured by Loungefly, this matching tote (16" x 14") and wallet (8" x 4") have sateen and embroidered details on their fronts. 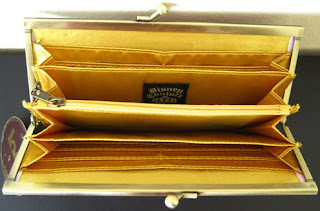 The wallet has a magnetic flap closure and also a long zip coin pocket on the inside behind credit card slots. Tote original list price $44.99 (USD), less for the wallet. 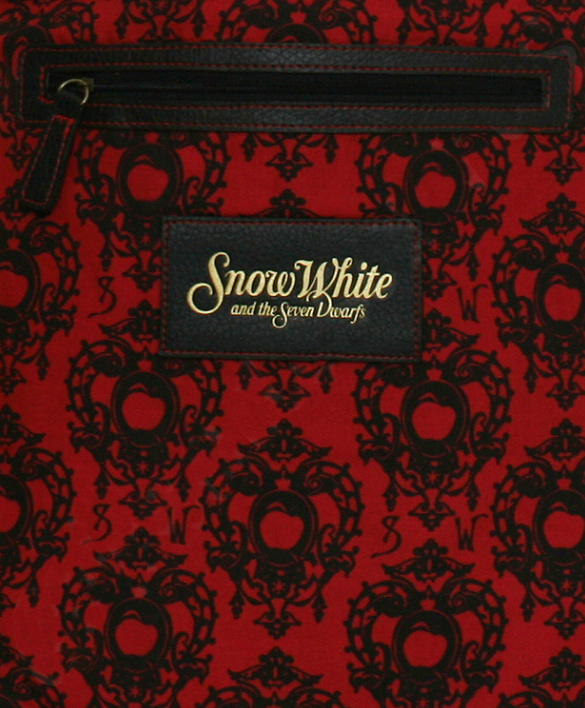 Loungefly Tote and Clutch (2009-10). 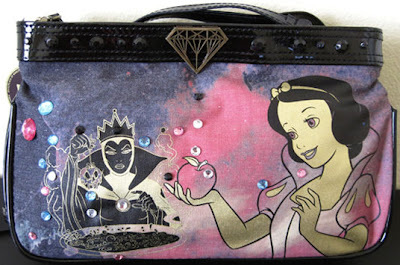 Disney Couture clutch bag (9” x 5") with screen art and colored rhinestones. 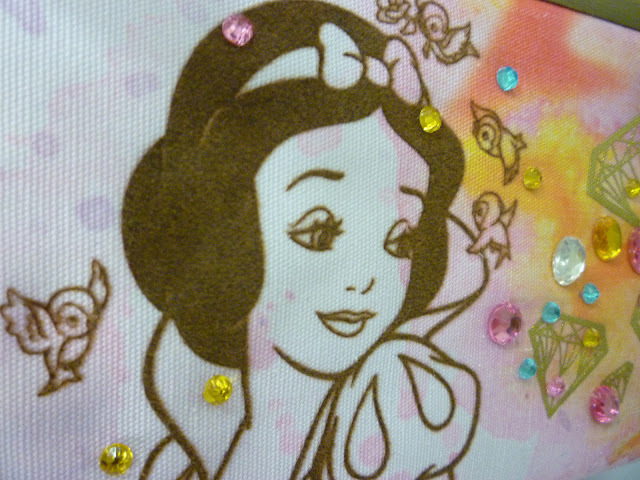 Satin lining and cotton canvas. 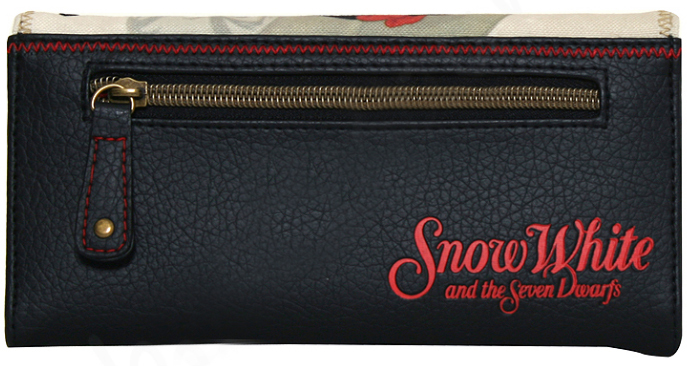 Two magnetic snap and one zippered compartments. 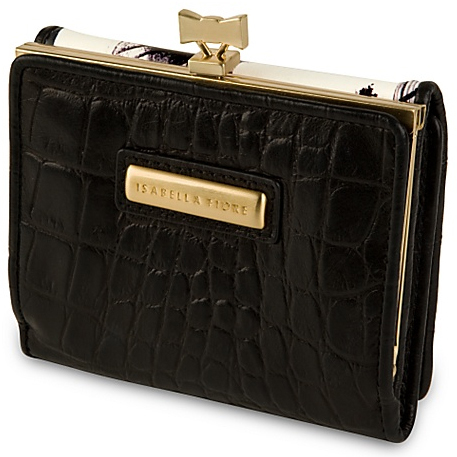 List price $34.95. 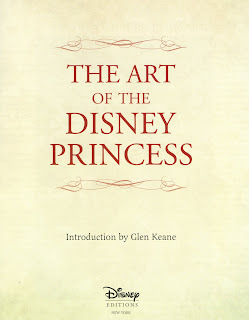 Was still available through the Disney Store not too long ago. 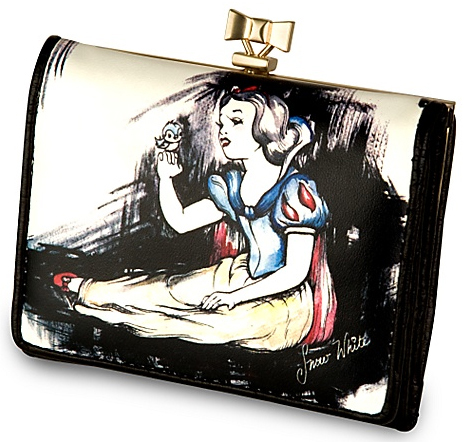 Disney Couture Clutch (2010-11). Images snapped at TrenD. 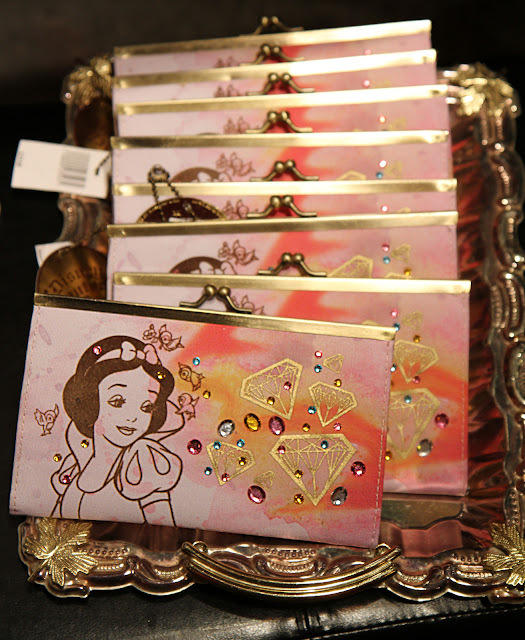 Additional image via Disney Store. This kiss lock expandable envelope wallet (7.5" x 4.5") utilizes the same artwork as the clutch bag above. 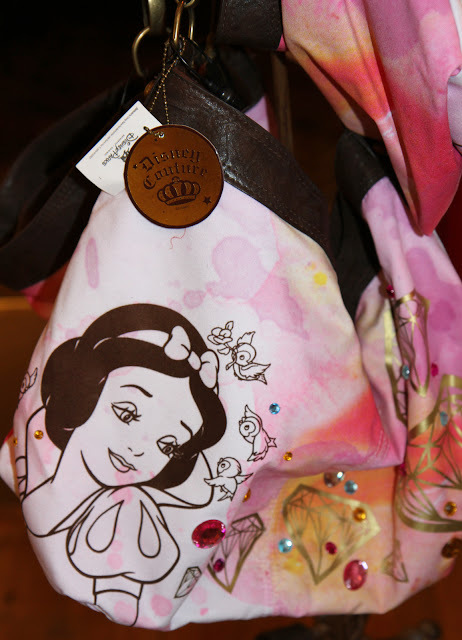 From the Loop NYC Disney Couture Collection, it has a nylon body with printed art and applique, "jewel" embellishments, and satin lining. 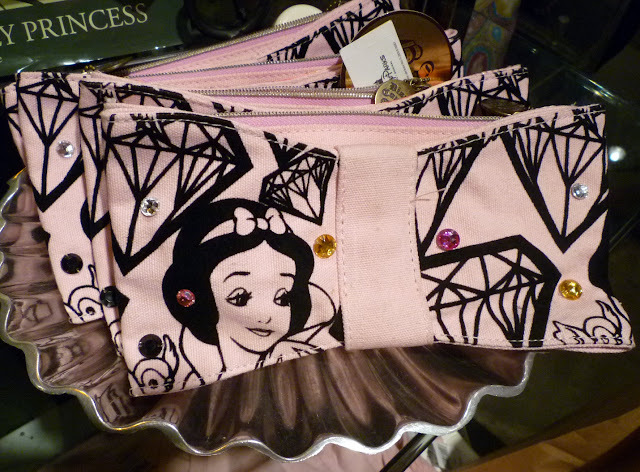 It was seen at the WDW TrenD store in Downtown Disney last February and at Disney outlet stores in the spring. $30.00. 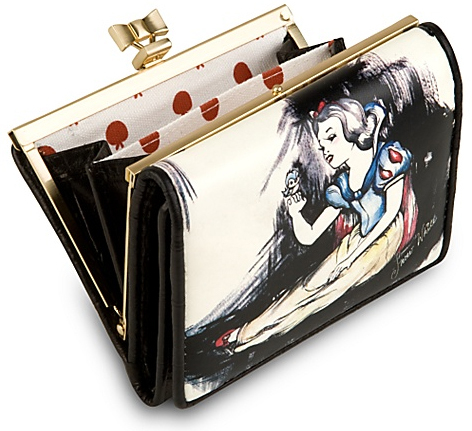 Loop NYC Disney Couture Wallet (2011). 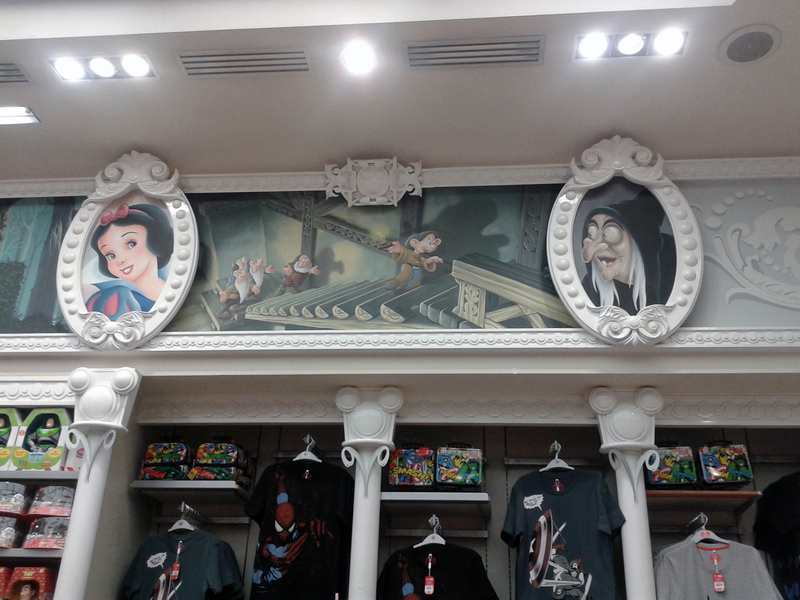 Images snapped at TrenD and Disney Store Outlet. 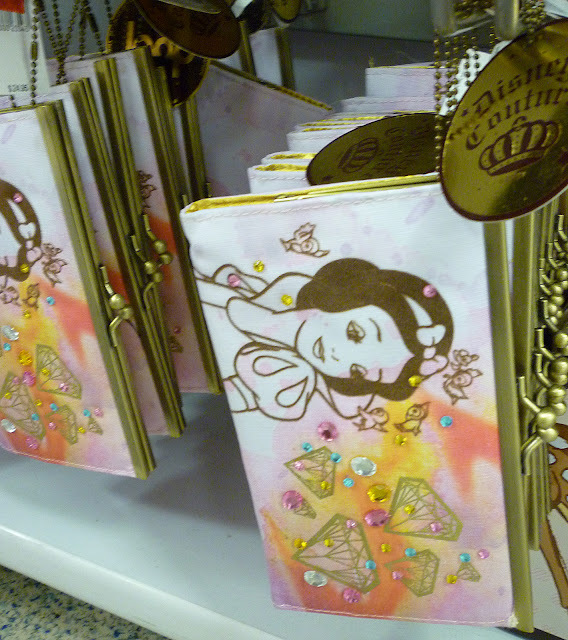 From the same series as above, this Disney Couture purse was also available from WDW's TrenD this past February. 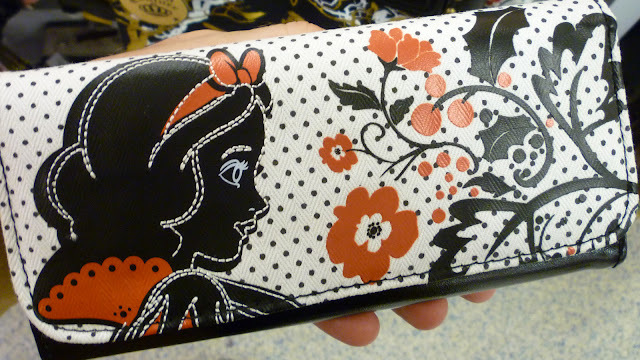 Disney Couture Purse (2011). Images from TrenD. 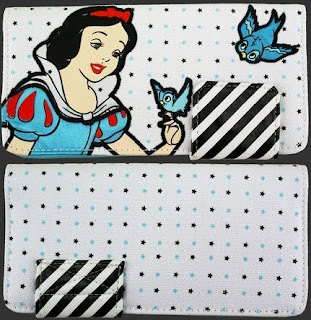 Designed by Isabella Fiora, this leather Snow White billfold (4 1/2'' x 5 1/2'') opens to 12 card slots plus a clear plastic-covered ID holder. 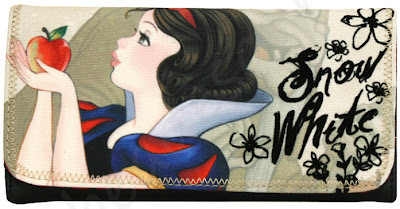 Another nylon body purse (11" x 7") from the Loop NYC Disney Couture Collection. 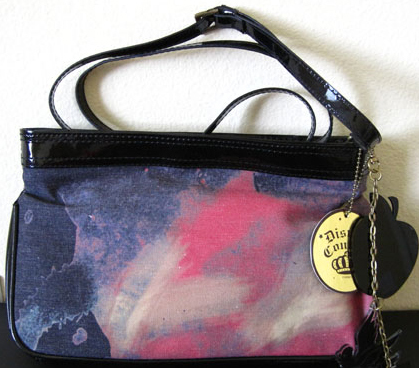 It has an adjustable shoulder strap that can be removed to convert it into a clutch. TrenD had it for sale at the beginning of this year. Disney Couture Purse/Clutch (2011). 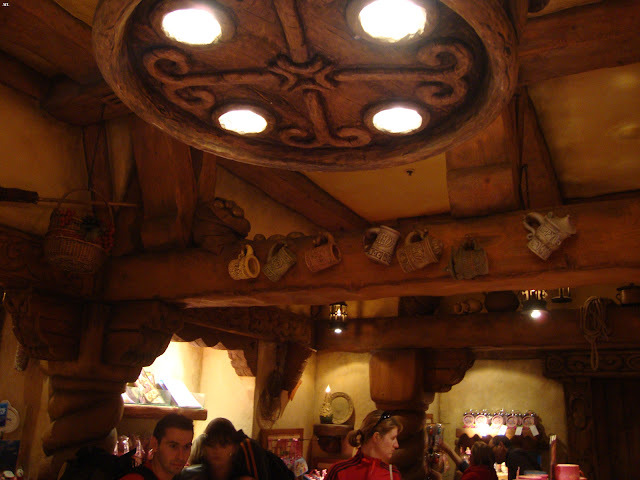 Images via Regencies. 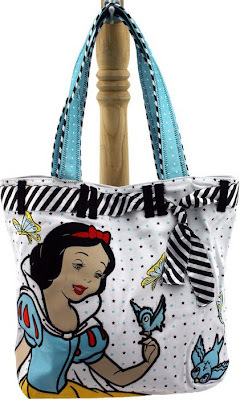 This Loungefly nylon canvas bag (16" x 14.5 ") has a faux leather handle and trim. 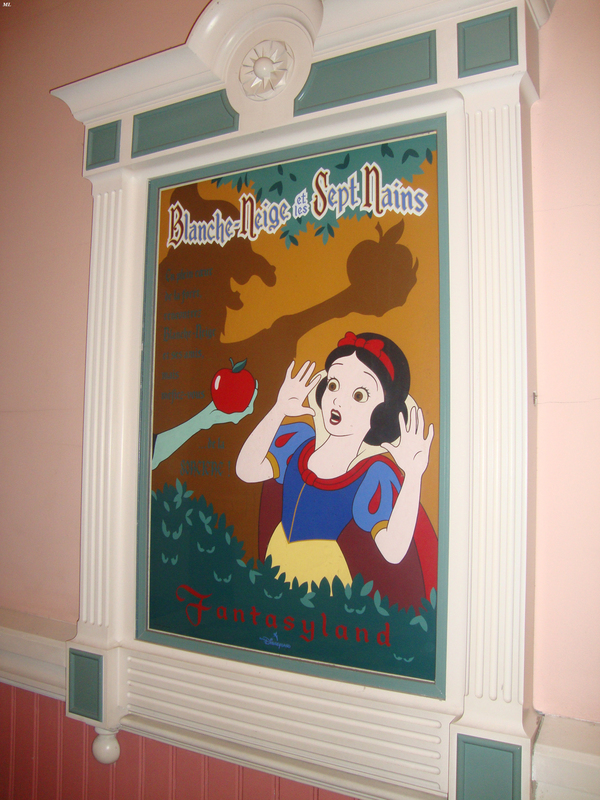 Features a dynamic image of the princess holding the poisoned apple with the witch gazing on in the background. Infamous text reads, "Snow White. Lips as red as the rose, hair black as ebony, skin white as snow." Floral design on back. 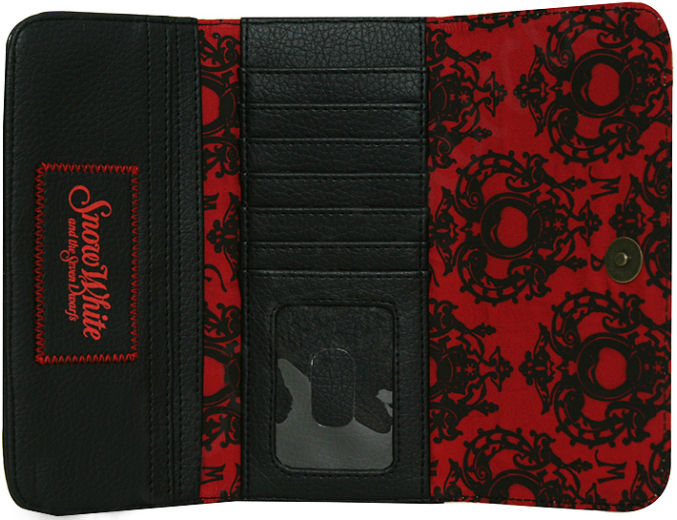 Inner lining is in red with black wallpaper style swirls and apples. 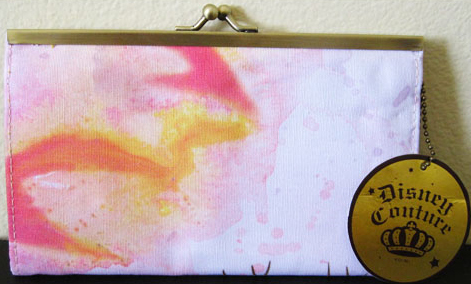 Zippered pocket. S60.00. 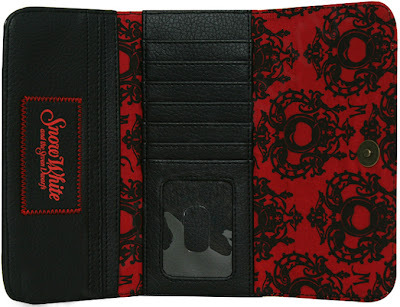 Matching wallet (8"X 4"), $35.00. 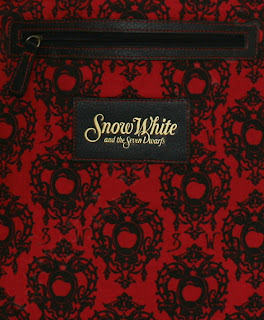 Loungefly Tote and Wallet. Images via Beadesaurus. 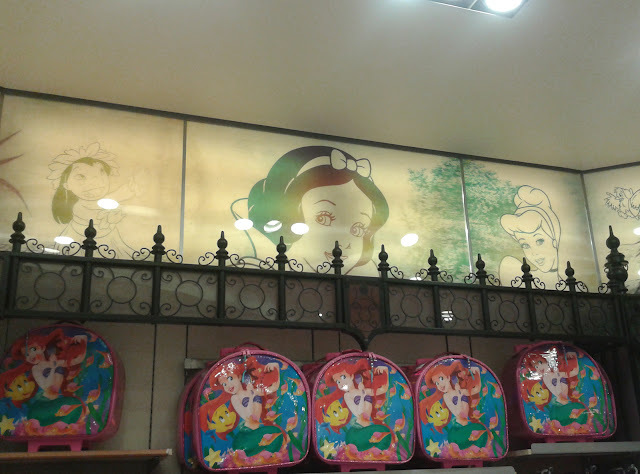 Cool bags! 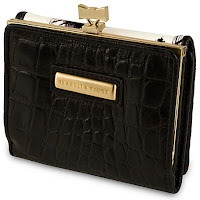 Too bad they don't offer 'em in man-purse varieties.